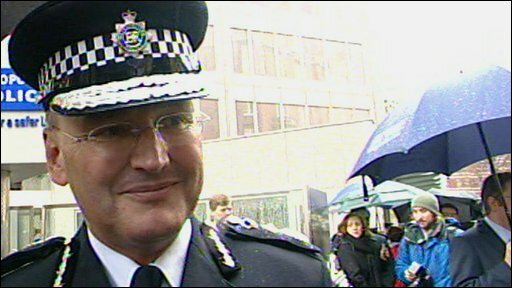 Sir Paul Stephenson has been named as Metropolitan Police Commissioner, the top job in British policing. Sir Paul, 55, who was deputy to previous chief Sir Ian Blair, said he was "enormously proud" and was looking forward to the challenges ahead. He said his priorities would include cutting crime, and convincing all the communities of London that the Met was on their side. The home secretary said Sir Paul had stood out in an extremely strong field. He was chosen for the £253,000-a-year post ahead of Sir Hugh Orde, the Chief Constable in Northern Ireland. Home Secretary Jacqui Smith made the decision, but conducted interviews jointly with London Mayor Boris Johnson, whose backing the new chief requires. Mr Johnson described Sir Paul as an outstanding candidate and said his appointment had "cross-party consensus". Sir Ian quit in October, saying he did not have the mayor's support. His tenure, which began in February 2005, had seen a number of controversies, including the fatal shooting of Jean Charles de Menezes, who was mistaken for a suicide bomber. "I'm such a hugely proud policeman to be asked to lead the Met in bringing safety to millions of Londoners, millions of visitors and leading the Met's national efforts," he said. He said the job of the Met was simply to deal with crime and make the streets of London safer. "We have to be intolerant of violence, no matter where that violence comes from," he said. "We've got to make sure we are delivering. That's our job, it's my job to lead that delivery." Sir Paul, who had been deputy for four years, took over as acting commissioner when his former boss stepped down in December. Days later, he faced tough questions after the arrest of Tory frontbencher Damian Green by officers investigating leaks from the Home Office. The resulting furore put Sir Paul into the media spotlight and left politicians outraged at the search of the MP's Commons office. But BBC home affairs correspondent Danny Shaw said it is understood his handling of the arrest worked in his favour during the selection process. He said the episode showed Sir Paul was prepared to stand up for officers who took a difficult decision, rather than pass the buck. Our correspondent added: "Sir Paul is described as a gritty, no-nonsense copper, who likes an argument." Leading a staff of more than 50,000 and overseeing a £3.5bn budget, he will be expected to continue the fight against terrorism and make the 2012 Olympic Games secure. The Met takes the national lead in all aspects of counter-terrorism, including intelligence, investigations and prevention. The two final candidates for the vacated position had been seen as evenly matched. Both men have distinguished careers spanning more than 30 years, counter-terrorism experience, and perform well in the spotlight. Sir Paul Stephenson started out with Lancashire Constabulary in 1975 and, after becoming a superintendent, spent time with the Royal Ulster Constabulary. In 1994 he was appointed assistant chief constable of Merseyside before moving to Lancashire, where he became chief constable in 2002. In February 2005, he moved to the Met, to fill Sir Ian Blair's previous role when he stepped up to the top job. So far his role has included the oversight of strategy, modernisation and performance. Sir Paul was awarded the Queen's Policing Medal for services to policing in May 2000 and received a knighthood in the Queen's Birthday Honours List last June. Sir Hugh Orde began his career with the Met in 1977 and was deputy assistant commissioner when he left in 2002 to take on the leadership of the Police Service of Northern Ireland. Two other contenders, chief constables Sir Paul Scott-Lee, of the West Midlands force, and Bernard Hogan-Howe, from Merseyside, had earlier been eliminated from the running.